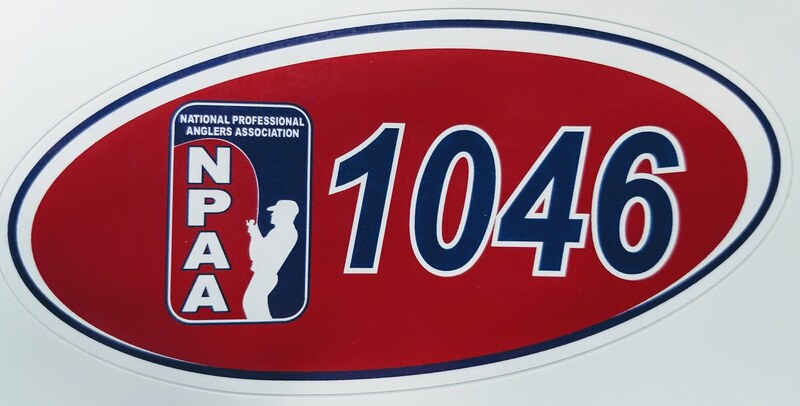 The Wednesday Fishing League (WFL) was started many years ago to gather friends at local lakes on a weekday to have some fun and compete in a friendly bass tournament. I created these events well over a decade ago and have created and made many friendships through them. In the past 6, 7 or 8 years (time flies when you have fun) my same partner for these events has been Don Henry. We have had a lot of good times, our fair share of successes and head-scratching nights too. No matter what mood the bass are in on that particular night, we make the most of it and have a good time. This past Wednesday was no different, except we both know that our fishing time together at these events are about to end. With my upcoming move to Independence I will be stepping aside or course, but the times spent with Don, talking about everything under the sun and catching a few bass will always be remembered. This past Wednesday was fantastic, we figured out the bass that night at Rock Creek Lake. 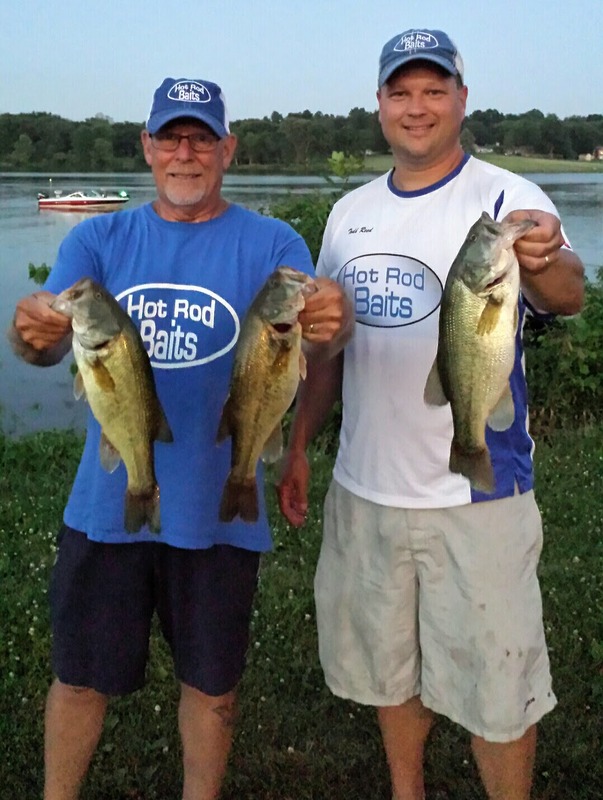 Presenting Hot Rod Baits tubes and big craws with a 1/8oz sinker was the ticket. Fish were located much more shallow than we had figured, but the ones we caught were stuffed with food in their big bellies telling us we found feeding fish. We ended up with 4 keepers that night, which told us we figured out the bass. Typically when you can do this in a 3 hour tournament you will place high, that night was a win for us on so many levels! This past week I had the chance to fish with my two best fishing buddies...my kids. We took our annual 3-day trip to fish for bluegills and enjoy nature. Enjoying nature is never a hard thing to do, as both of our kids are under 10 years old and are very inquisitive. They loved being outdoors, and they love to fish even more. Bluegills were the target on this small 40 acre lake in Tama County. It is rather deep, up to 20+ feet in several areas. 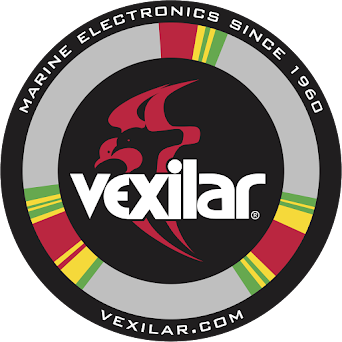 I knew the bluegills had to be close to ending the spawning routine, so I had a hunch they would be out deeper...enter the summer edition of the Vexilar. Many anglers put their Vexilars away once the ice melts, and every year I tell them that it is a mistake. I have installed the FL-10 on the bow of my boat, it is always there and ready to show me the fish. Installing this was very easy, as it is a flush mounting system and the FL-10 package comes with everything you need to install it on your boat. Cruising throughout the lake I saw the familiar red lines on the Vexilar and I knew exactly what we needed to do. 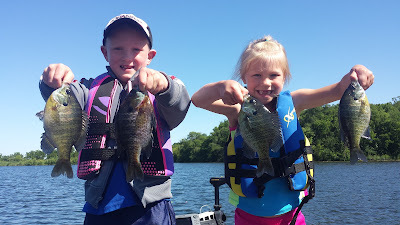 Suspending bluegills on slip bobbers is pretty fun, and my kids had a blast. Most of the fish we caught were in about 10-12 feet of water, and the gills were hanging around the 6 foot mark. It became as simple as; find suspending fish, drop the Talons, and cast the slip bobbers. We had a great time catching bluegills and the occasional largemouth bass too. Another great trip with the kids, thanks to the Vexilar FL-10.